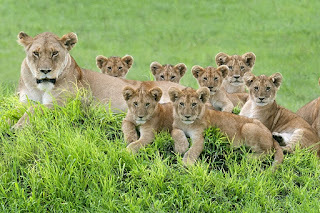 Gay Lovestruck Lions cuddle up in Safari park(photos) - BlogIT with OLIVIA!!! TWO male lions share a mane-on-mane cuddle — after ignoring all the females in their pride. The lovestruck duo were snapped in a safari park, where guides said they had been cosying up together for a week. Belgian visitor Nicole Cambré, took the photo at the sprawling Kwando Concession in Botswana, southern Africa.